WOW!! WHAT A VALUE!!! THIS GRACIOUS COLONIAL IS THE ONE YOU'VE BEEN WAITING FOR!! SITTING PRETTY ON A 1.1 ACRE LOT AT THE END OF A CUL-DE-SAC, THIS BEAUTY AFFORDS PRIVACY IN PRESTIGIOUS LAWRENCE FARMS EAST!! JUST PACK YOUR THINGS AND MOVE RIGHT IN TO YOUR DREAM HOME TODAY!! THE MAGNIFICENT LIVING ROOM WITH A COZY FIREPLACE & HARDWOOD FLOORS IS PERFECT FOR RELAXING WITH THE FAMILY ON THOSE COLD WINTER NIGHTS OR ENJOYING THE BIG GAME WITH FRIENDS. THE ENORMOUS ORIGINAL KITCHEN COMES FULLY EQUIPPED WITH NEW SS APPLIANCES, PERFECT FOR ANY CHEF. AND THE MASSIVE YARD THAT HAS BBQ WRITTEN ALL OVER IT, IS PERFECT FOR ENTERTAINING. FROM THE WELL PROPORTIONED ROOMS, WELL-MAINTAINED ANTIQUE BATHROOMS, 3 SEASON PORCH AND CLOSE PROXIMITY TO CHAPPAQUA, MT KISCO AND ARMONK SHOPPING; THIS GEM HAS IT ALL!! YOU HAVE GOT TO SEE THIS TODAY!!! 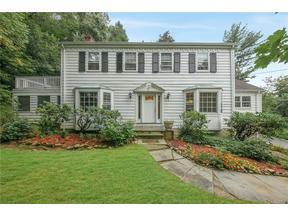 PERFECT LOCATION, PERFECT PRICE AND DON'T FORGET THE AWARD WINNING CHAPPAQUA SCHOOL DISTRICT!! THIS ONE WON'T LAST! !